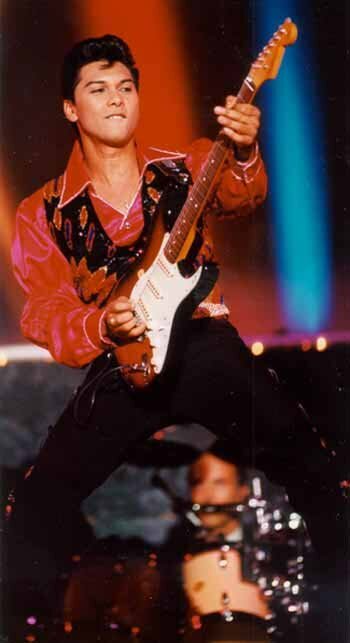 After a one-week engagement in September, 1997, in which audiences raved about his tribute, our Ritchie Valens Impersonator #1 returned to the Imperial Palace Hotel and Casino in "Legends In Concert". He portrays Ritchie Valens, a young man whose incredible life was tragically cut short. "Ritchie was only 17 years old with two big hits on the top of the charts when he died tragically" he recalls. "He never really had a chance to enjoy stardom. I want the audience who did not know or recognize Ritchie to relive that time through my work". A native of Trinidad who moved to Canada as a youngster and a self-taught musician, he began his professional career in high school and later toured across Ontario with an Elvis Presley tribute show. He is a versatile performer who not only sings but plays guitar, bass, piano, and drums. "My best musical work is from the '50s and '60s, but I listen to everything," he says. "I love Elvis, Edie Cochran, Chuck Berry, Gene Vincent, Bill Haley, and Kiss". His amazing live recreation brings audiences to their feet. "When the hit film La Bamba came out, people started labeling me Ritchie Valens. I was an instant fan when I first heard 'Oh Donna' and 'Come On Let's Go'. Call and book celebrity impersonators or celebrity lookalikes now !